Sophi Kravitz is a huge fan of SparkFun, ever since she got to spend two weeks as a hacker in residence in 2013. Currently now Director of Product at Supplyframe (Hackaday's parent company), she is still hacking hardware whenever possible. Our community is incredibly talented, and our planet needs smart technical solutions more than ever, so we invited Sophi to tell us more about how you can enter to win the Hackaday Prize and, you know, save the world while you're at it. 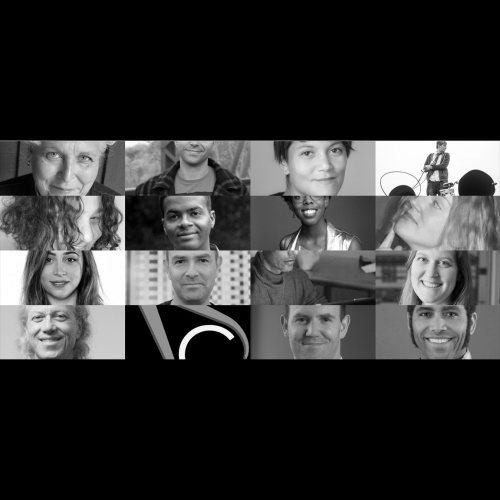 The Hackaday Prize, the hardware hackers' Academy Awards, has just launched. Not only can you compete to be one of 100 talented individuals taking home a piece of the $200,000 prize pool, but the coolest projects also run a chance of being featured on Hackaday! The 16 Celebrity Judges are big names in the hardware engineering industries. Among our judges is Sherry Huss, who co-founded Maker Faire, and who I consider to be the original Maker-in-Chief. Under her leadership, makers everywhere were given a voice and a place to show their work. Other notable judges include Lauren McCarthy, a computer scientist who invented p5, and Kwabena Agyeman, FPGA engineer and creator of the CMUcam. All 16 judges have experience running companies, creating startups, and engineering ambitious projects. Together, they will decide who will win the 2018 Hackaday Prize. In 2018, we're faced with problems that can be solved, fully or partially, with technology. With everything going on in the world, hope is needed now more than ever. So we decided to give this year's Hackaday Prize the theme of Building Hope. We chose five challenges for this year's prize based on the issues we know our community can help with. We're starting with an Open Hardware Design challenge. This first round allows everyone to explore their ability to plan an incredible project, followed by four prototyping rounds. 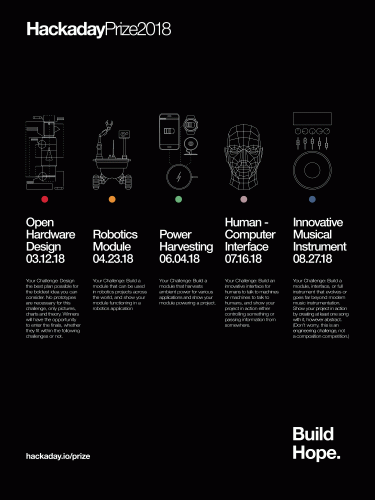 We think that you, the open hardware community, can create something truly impressive - something that instigates change in the world - with the challenges that follow: Robotics, Power Harvesting, Human-computer Interface, and the Musical Instrument. 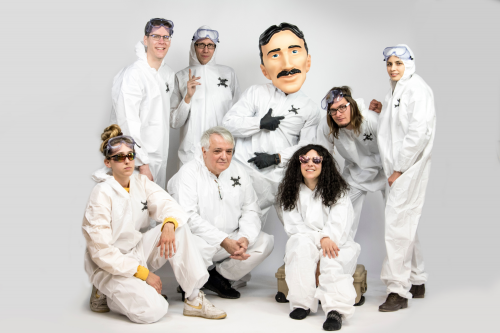 In 2014 we launched The Hackaday Prize for the first time to our smart, talented, enthusiastic community of engineers, scientists, designers, and creatives everywhere. Over 600 projects were created, and the winner, SatNOGS, now has a foundation where they are continuing the work they started here. In 2017, we had 1,100 incredible entries and a huge global community that supported the Hackaday Prize. The winner of the Hackaday Prize was Alex Williams, with an underwater explorer robot.SparkFun's own Pete Dokter was a Hackaday Prize judge in both 2015 and 2016! 2015's Hackaday Prize winner, the Eyedrivomatic, directly impacted the lives of many with limited mobility. 2016's winner was Dtto, a search and rescue robot, an open source project that is continuing to be worked on. Over the past four years the Hackaday Prize has given away $1 million to open hardware projects making change in the world. 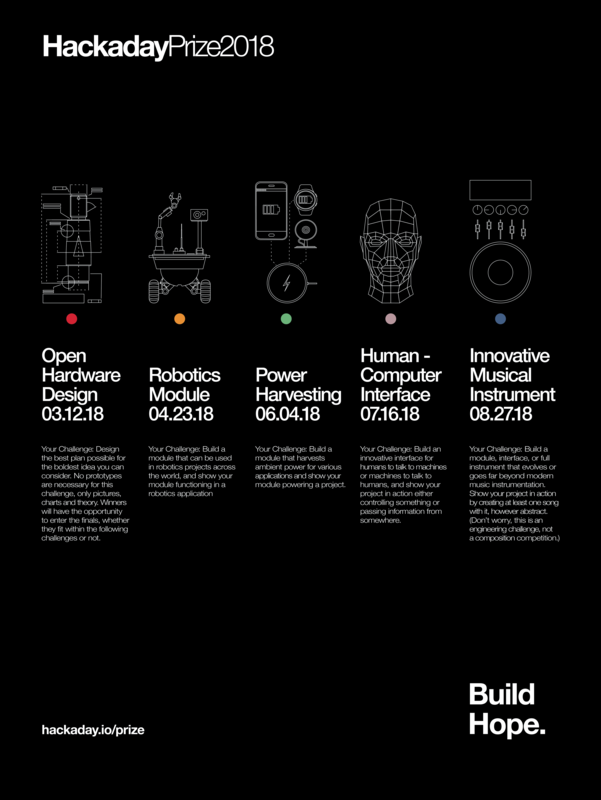 All of us at Hackaday are excited to be a part of this effort for the 5th year. Join us in creating a better, brighter, and more fun world. Check out our super entertaining video (with surprise guest)! We challenge you to come up with something special, and enter it in this year's Hackaday Prize. I donât want to wait until Friday; i want now so i can see what the community is talking about.